The Young Ones Limited sponsor a child called Samruddhi from the El Shaddai Street Child Rescue Charity. 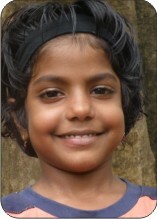 BACKGROUND - Samruddhi is aged between five and eight years and currently lives in the house of Kathleen and has been living there since May 2011. The House of Kathleen was formed to give street children a home and a refuge from the slums of India. Samruddhi’s father was a scrap collector and her Mother sold fish for a living however her Father left his family leaving his wife to bring up their three children alone without any support. Samruddhi’s Mother could not support her family financially and she would leave them home alone each day for long periods of time due to going out to work. This led to the Mother asking the child rescue organisation for help as she did not want her children suffering anymore. Samruddhi now feels happy and safe in her new home that allows her to be educated and cared for. When Samruddhi grows up she wants to be a tailor and hopefully through the love and support given she will be able to realise her dream. AT THE NURSERY - The children within the setting have been shown photos of Samruddhi’s home town and the community where she lives in. The children enjoy listening about Samruddhi and love to draw and paint pictures to send to her. This provides many positive learning experiences for the children to experience. It allows the children to look at the different communities and cultures within our world. The nursery decided to raise money for the El Shaddai Street Child Rescue Charity and we decided to hold a Great British Bake Off. It allowed the children, parents, grandparents and staff to work together to make cakes that could be sold at our bake sale. This extended children’s learning experiences even further and it allowed the children to be fully involved from start to finish. The Young Ones Ltd bake sale raised £170.00 for the charity and this is just the start of our fun raising events for the El Shaddai Street Child Rescue Charity.